Govardhana Puja - October 20, 2017 ~ The Toronto Hare Krishna Temple! The Toronto Hare Krishna temple will be celebrating Govardhana Puja on Friday, October 20, 2017. Govardhana Puja is an especially "sweet" festival! During the time of Lord Krishna, the villagers of Vrindavan used to honour King Indra, the demigod responsible for providing rain for harvest. One day, young Krishna convinced the villagers to celebrate Govardhana Hill instead of Lord Indra because it was the soil of the hill that provided grass for the cows and bulls to graze and then they provided milk. Thus, the hill should be worshiped. King Indra got infuriated and sent massive thunderstorms as punishment. 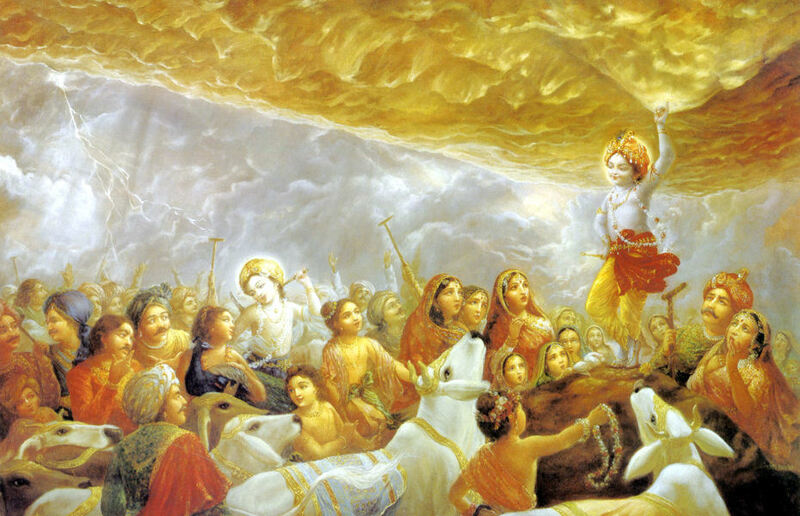 Lord Krishna calmly lifted Govardhana Hill with his little finger to provide shelter for Vrindavan’s residents. After seven days of continuous thunderstorms and rain, King Indra surrendered and asked for forgiveness from Lord Krishna. He realized his true position as a servant of Lord Krishna. On Friday, October 31, 2017, the temple will build a Govardhana Hill replica, made of prasadam, to worship Lord Krishna as the lifter of Govardhana HIll and worship the cows and bulls who are so dear to the Lord. The program will take place from 6:00pm to 9:00pm! We hope to see you there! Very nice and such a meaningful lines you have mentioned in your blog.